If you are anything like me and you enjoy adding a little fun to your routine, I challenge you to give this fun workout a try. I have always been a huge fan of the Just Dance games. Each new game seems to just get better and better. Just Dance 4, the newest addition to the Just Dance line of games by Ubisoft, certainly does not disappoint and boy does it help you get your groove on. Loaded with current hits as well as a few favorites from the past, you can dance solo til you can’t dance no more, or you can gather up your family and friends and challenge them to one crazy dance party! Perfect for all ages, it’s one of those games geared for everyone. With a 21-year-old, 10-year-old and 5-year-old, finding games that the whole family will enjoy can often be a challenge; Just Dance 4 has given us an especially fun reason to chill out and enjoy some family time together. And now with the newly released Just Dance Disney Party, we can rock out to all of our favorite Disney movie and Disney channel favorite tunes as well. I have been taking a bunch of Zumba classes lately and there is something about dancing that really grabs my attention and helps the time fly. I have been finding that Just Dance 4, although not Zumba style, gives me that same boost and adrenaline rush that I get from taking my Zumba classes. It’s one of those workouts that I can do in a pinch at anytime of day. I find myself being silly, singing out loud and jamming all of my stress and troubles away. My daughter will gladly join in if she happens to be home from school and I love that we get to bond while doing something fun and healthy together. She usually makes me promise that we will play Just Dance 4 first and then enjoy a few tunes from Just Dance Disney party after. Now when I have to miss the gym because of my hectic schedule or the cold winter weather settling in with more time spent indoors, now I have a wonderful alternative right in my own home. I first previewed Just Dance 4 and Just Dance Disney Party at the Digital Family Summit in Philadelphia this past June. Ubisoft had sponsored a fun 80s party and my husband, kids and I had the privilege of attending. While at the party, we had the opportunity to preview Just Dance 4 and Just Dance Disney Party. My son was telling us that his gym teacher at school sometimes sets up Just Dance games during their gym classes and the kids get to workout along with the game. The kids love it and I think it is a great way to encourage the kids that own these games to get up and move at home too. Jam packed with over 40 energetic songs, with Just Dance 4 you are sure to find not only current hits like Carly Jepsen’s Call me Maybe and One Direction’s What Makes you Beautiful, you will also hear classics like Elvis’ Jailhouse Rock and Ricky Martin’s Livin La Vida Loca. Just Dance Disney Party is loaded with familiar tunes such as Mary Poppin’s Supercalifragilisticexpialidocious and The Little Mermaid Under the Sea as well as Disney channel favorites like Good Luck Charlie Hang in there Baby and Jessie Hey Jessie. (I cannot help but crack up watching my 5-year-old sing and jam to all of these kid tunes). Some of my favorite features of Just Dance 4 include the ability to play in Battle Mode, where you challenge the others you are playing with in six rounds of dance battles. I also love the personal workout sessions which you can create personalized sessions that really work for you while also integrating a calorie counter to watch your burn. Favorite features of Just Dance Disney Party is the ability for the kids to play continuously without having to stop or pause between songs. Since my kids have their favorite songs, together we can create their own play lists with up to 10 songs to keep them happy and interested, especially if there are certain songs that are less familiar or not as appealing to them. Finally, they have the ability to enjoy balloon pop mode where they hold the Wii remote and move all around popping balloons and gathering more points as they go. My daughter loves this! Now that Thanksgiving is over and I know it’s time to get back on track with my diet and exercise plan, I am looking forward to adding the Just Dance games to my workout plan. Although my kids are reluctant to let the games go, I will also be passing these along to my children’s gym teachers to check out and enjoy with the kids at school. Hopefully it will be another fun, fresh new way to keep the kids happy and moving in gym class. 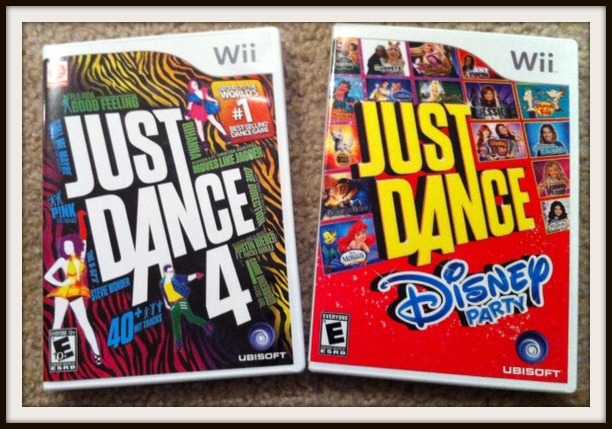 If you own a gaming system and are looking for fun ways to stay fit or keep the kids moving while having fun indoors, be sure to add Just Dance 4 and/or Just Dance Disney Party to your holiday gift list. It’s the perfect balance of fitness and fun! You can find it at local retailers as well as online at Amazon HERE and HERE. Don’t forget to stop back and let mw know what you think! Disclosure: Ubisoft provided me with Just Dance 4 and Just Dance Disney Party for Wii to facilitate this review. All opinions are 100% my own. 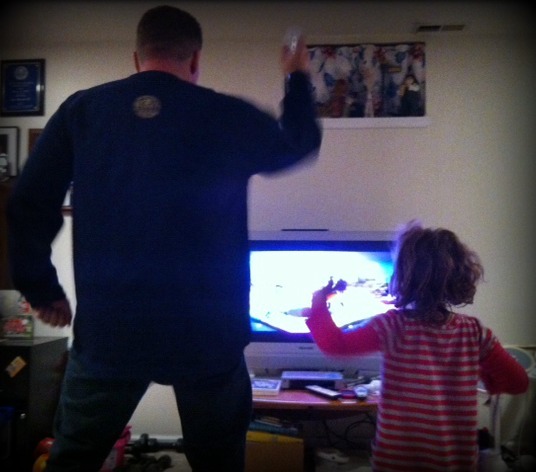 Really Fantastic Family Fun with Just Dance.Thanks for sharing this wonderful post. you an email. I’ve got some creative ideas for your blog you might be interested in hearing. Either way, great blog and I look forward to seeing it grow over time.